, 1849. 1849. Bifolium. Addressed to Washington Irving on verso in pen. 8vo. Old folds. Bifolium. Addressed to Washington Irving on verso in pen. 8vo. IRVING'S COPY. THE BEGINNING OF NYPL. "The first meeting of the trustees came on May 20, 1848. Cogswell was appointed superintendent of the library, with authority to convene the trustees and to preside over their meetings. 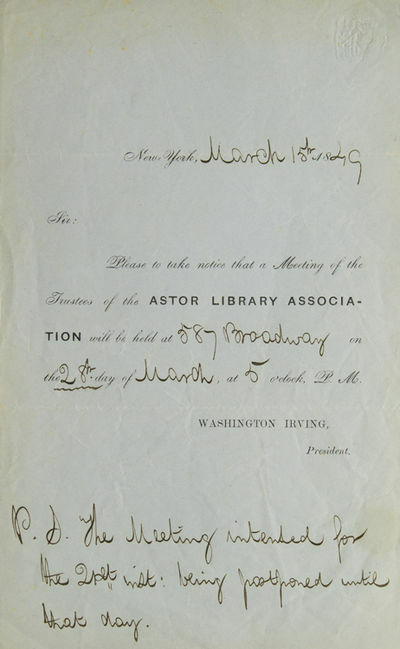 The name of "The Astor Library" was chosen for the institution at the second meeting on June 1. On September 28, a location was finalized for the building, what is now the East Village, Manhattan. There it was judged to be tranquil enough to be suitable for study. The lot was valued at $25,000, which sum was deducted from the $400,000 of the endowment.&#11;&#11;In January 1849 the library was incorporated and received a paragraph in the annual message of Governor Hamilton Fish. In April 1849, the trustees hired a house at 32 Bond Street for temporary custody and exhibition of the books they had purchased. The trustees stated that "all persons desirous of resorting to the library and of examining books, may do so with all the convenience which it is in the power of the trustees to afford." At this time, the total number of books in the library was estimated at over 20,000 volumes, costing $27,009.33.&#11;&#11;A German-born architect, Alexander Saeltzer - who had designed Anshe Chesed Synagogue, - was selected as the architect for the building. He designed the building in Rundbogenstil style, then the prevailing style for public building in Germany. The limitation of the cost of the building at $75,000 was stringent: the trustees wanted a building to hold 100,000 volumes at the outset, to afford convenient accommodation for annual additions, to be fireproof, and have the necessary strength; these requirements were by no means easily secured for this sum. W. B. Astor, Cogswell, and Saeltzer drew up specifications and called for bids for construction. All bids exceeded the $75,000 limit: the lowest, by contractors whose ability to finish the work was by no means satisfactorily established, amounted to $81,385.75; the highest, by thoroughly satisfactory contractors, amounted to $107,962. Saeltzer's plan was reworked, and for this plan the construction bid of $75,000, by Peter J. Bogert and James Harriot, was accepted on January 2, 1850.&#11;&#11;The cornerstone was laid on March 14, 1850, and the building completed in the summer of 1853. The limit of $75,000 proved an impossible one. William B. Astor bore the expense of $1,590 for groined arches to render the structure more secure from fire, and shelving and apparatus for heating and ventilating were paid for to the amount of $17,141.99 from surplus interest accruing from the funds while the building was in progress and from the premium realized by the advance in market value of United States bonds." Saint Paul: James M. Goodhue, printer, 1849. 16mo, pp. 15, ; original plain brown printed wrappers, fine. A very early - if not the first - piece of printing in Minnesota, exclusive of newspapers. Of the 14 pieces of printing identified by Martin in her Checklist of Minnesota Imprints, 1849-1865, only two items (Martin 6 and 8), broadside proclamations by territorial governor Ramsey bear an earlier date on the title-p. and one other (Rules for the Government of the House of Representatives) bears the same date. Includes standing rules for the legislative council, rules of order and procedure of the two Houses and a list of the standing committees of the Council, and joint committees of the House of Representatives. Rare. 100 copies were ordered printed. Martin 11 (MHS only). 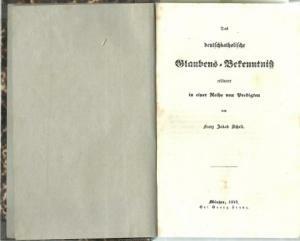 Jerabek 66 (identifying this as the first publication of the territorial legislature). 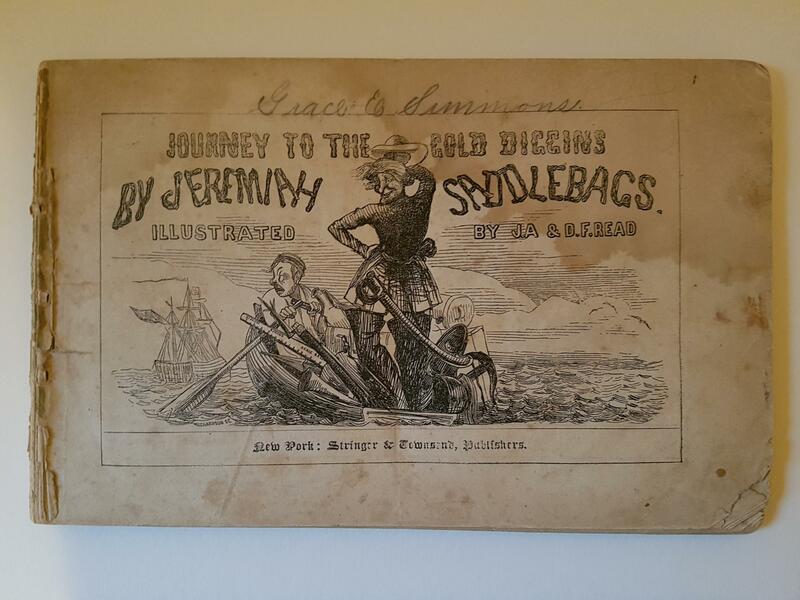 Kreidberg, Fragments of Early Printing ... in the Territory and State of Minnesota, p. 18: "The first public territorial issuance put into type was a booklet dated September 3, 1849, which appeared under James M. Goodhue's imprint. 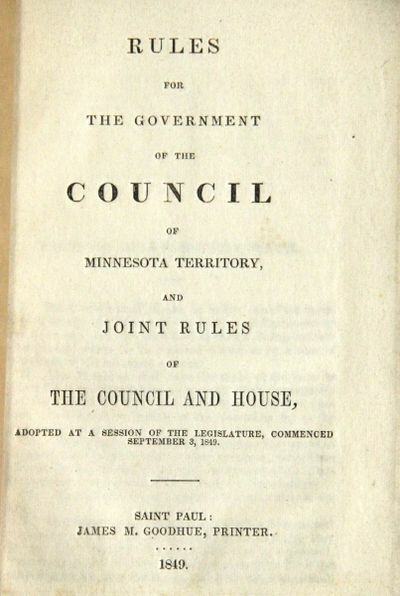 In fifteen pages of hand-set type, the territorial printer produced the Rules for the Government of the Council of Minnesota Territory..."
Cincinnati: George Conclin, 1849. 168pp. (lacks pp.129-152). Engraved titlepage vignette. 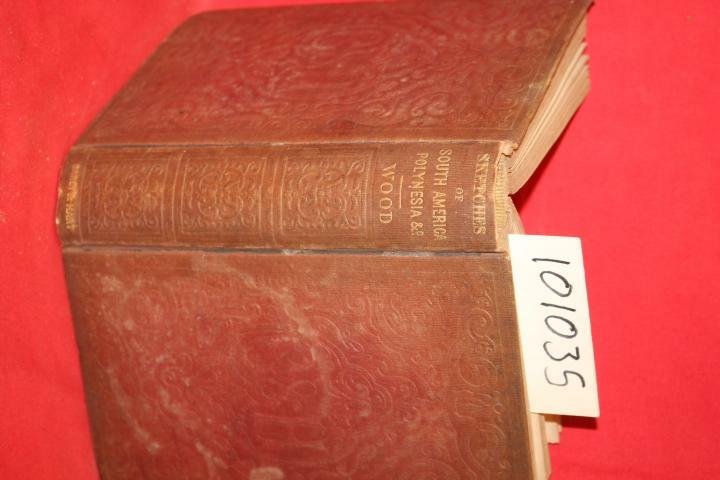 Modern three quarter morocco and cloth, spine lettered in gilt. Scattered foxing, mostly on the early and late text pages. Good. Lacks the frontis. The sixth edition (and the fifth known, as a second edition is noted as being published in 1845, but no copies are located) of the first guide to the overland trail. Hastings, a native of Mount Vernon, Ohio, was an early promoter of emigration to California. His propagandistic work played on the hopes and ambitions of emigrants, who were lured by the promise of "as much land as you want" in California. Hastings has been blamed for contributing to the Donner Party tragedy because of his promotion of a cutoff south of Salt Lake (his error was corrected). "...This is probably the most controversial of all guide books, and one of the most important early books concerning overland travel" - Mintz. Though Hastings' guide was popular in its day, any contemporary edition is scarce on the market, including the present sixth edition, with Kurutz locating only three copies (CtY, CSmH, PP). The missing pages are from the chapters 13-15, which include a description of California. Imperfect, but so was the advice. HOWES H288, "b." ZAMORANO 80, 41 (ref). GRAFF 1815 (ref). COWAN, p.270. MINTZ 215 (ref). WAGNER-CAMP 116:6. KURUTZ 320b. 96 pages Paris, [imprimerie de Plon frères], 1849, in-16, 96 pages, chagrin vert, dos à quatre faux nerfs, tranches dorées, dentelle intérieure, Ouvrage anonyme. L'auteur y raconte les souvenirs d'un voyage entrepris à la suite des évènements de 1814 et de 1815. "J'étais oisif et cette vie me déplaisait", confesse t-il. Il partit accompagné d'un abbé, L.., ancien camarade de classe. De cet abbé, on sait qu'il fut ordonné prêtre en 1820, qu'il connut un grand succès en tant que prédicateur, qu'il fut chanoine d'Orléans puis qu'il fut nommé curé d'une paroisse de Saint-Germain à Paris, jusqu'à sa mort en 1835 (note en pied des pages 39-40). Une annotation manuscrite sur une garde blanche, signée C.E.G, donne quelques renseignements supplémentaires sur l'ouvrage et son tirage: "Cet opuscule tiré à 20 exemplaires seulement, ne s'est pas vendu". Deux lettres autographes auraient été rajoutées à cet exemplaire, lettres qui n'y figurent plus, et qui auraient été de la main d'un abbé, Landrin, probablement l'abbé L... qui accompagna le narrateur au cours de sa traversée de la Normandie. Exemplaire truffé: il contient 30 dessins à la plume qui illustrent le récit avec drôlerie. Le style confine à la caricature et rappelle, dans l'inspiration, les illustrations de Daumier, Gavarni ou Henry Emy, prisées à la même époque. En outre se trouvent, in fine, 6 cartes des différentes provinces de la Normandie (Seine-et-Oise, Eure, Calvados, Manche, Orne, Eure et Loire), provenant de l'Atlas portatif de France de Perrot et Tardieu publié en 1833. Traces de découpes de feuillets à la fin: elles correspondent sans doute aux lettres de Landrin évoquées dans la note citée plus haut. Ouvrage peu courant. Frère cite une édition, parue la même année, dans le même format, mais qui ne contient que 48 pages. Trace d'un ex-libris, arraché, sur le contreplat. Accroc sur le plat supérieur, dos légèrement passé, coins usés. Rousseurs éparses. Frère II, 539. Stringer & Townsend 1849 - A must have for collectors of comic history. Topffer got the ball rolling with his 'Albums Jabots', Dore with Travaux D'Hercule. and this edition, exceptionally rare and important in the history of sequential comic works. 63,pp. 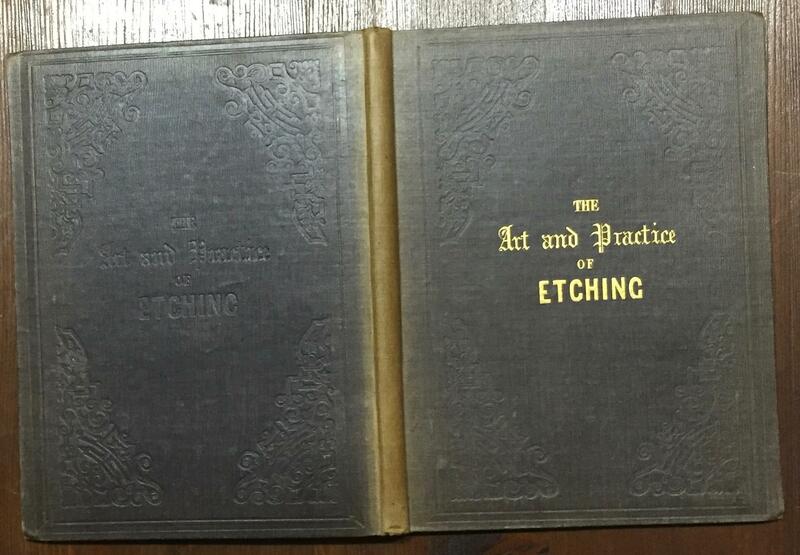 Pictorial title and 112 wood engraved illustrations. Oblong octavo. Guesdon Alfred dis. & Jules Arnoult lith. 1849. Bifolium. Addressed to Washington Irving on verso in pen. 8vo. Old folds. Bifolium. Addressed to Washington Irving on verso in pen. 8vo. IRVING'S COPY. THE BEGINNING OF NYPL. "The first meeting of the trustees came on May 20, 1848. Cogswell was appointed superintendent of the library, with authority to convene the trustees and to preside over their meetings. The name of "The Astor Library" was chosen for the institution at the second meeting on June 1. On September 28, a location was finalized for the building, what is now the East Village, Manhattan. There it was judged to be tranquil enough to be suitable for study. The lot was valued at $25,000, which sum was deducted from the $400,000 of the endowment. In January 1849 the library was incorporated and received a paragraph in the annual message of Governor Hamilton Fish. In April 1849, the trustees hired a house at 32 Bond Street for temporary custody and exhibition of the books they had purchased. The trustees stated that "all persons desirous of resorting to the library and of examining books, may do so with all the convenience which it is in the power of the trustees to afford." At this time, the total number of books in the library was estimated at over 20,000 volumes, costing $27,009.33. A German-born architect, Alexander Saeltzer - who had designed Anshe Chesed Synagogue, - was selected as the architect for the building. He designed the building in Rundbogenstil style, then the prevailing style for public building in Germany. The limitation of the cost of the building at $75,000 was stringent: the trustees wanted a building to hold 100,000 volumes at the outset, to afford convenient accommodation for annual additions, to be fireproof, and have the necessary strength; these requirements were by no means easily secured for this sum. W. B. Astor, Cogswell, and Saeltzer drew up specifications and called for bids for construction. All bids exceeded the $75,000 limit: the lowest, by contractors whose ability to finish the work was by no means satisfactorily established, amounted to $81,385.75; the highest, by thoroughly satisfactory contractors, amounted to $107,962. Saeltzer's plan was reworked, and for this plan the construction bid of $75,000, by Peter J. Bogert and James Harriot, was accepted on January 2, 1850. The cornerstone was laid on March 14, 1850, and the building completed in the summer of 1853. The limit of $75,000 proved an impossible one. William B. Astor bore the expense of $1,590 for groined arches to render the structure more secure from fire, and shelving and apparatus for heating and ventilating were paid for to the amount of $17,141.99 from surplus interest accruing from the funds while the building was in progress and from the premium realized by the advance in market value of United States bonds." MÜNCHEN. - Wenng, Gustav. 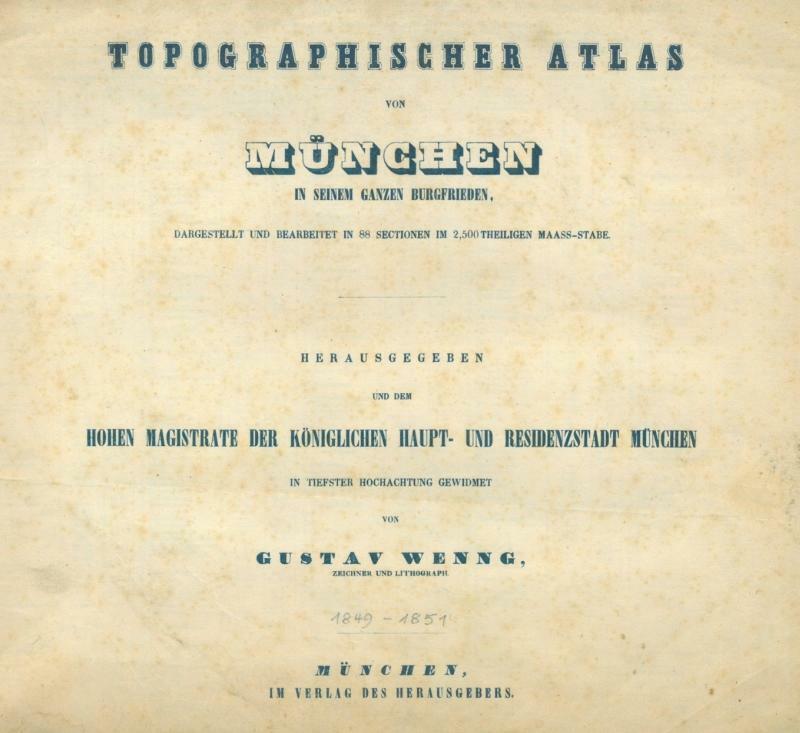 Topographischer Atlas von München in seinem ganzen Burgfrieden, dargestellt und bearbeitet in 88 Sectionen im 2,500theiligen Maass-Stabe. Herausgegeben und dem hohen Magistrate der königlichen Haupt- und Residenzstadt München in tiefster Hochachtung gewidmet. London: John Churchill, 1849. Shapter, Thomas (1809-1902). The history of the cholera in Exeter in 1832. xxviii, 297, pp. 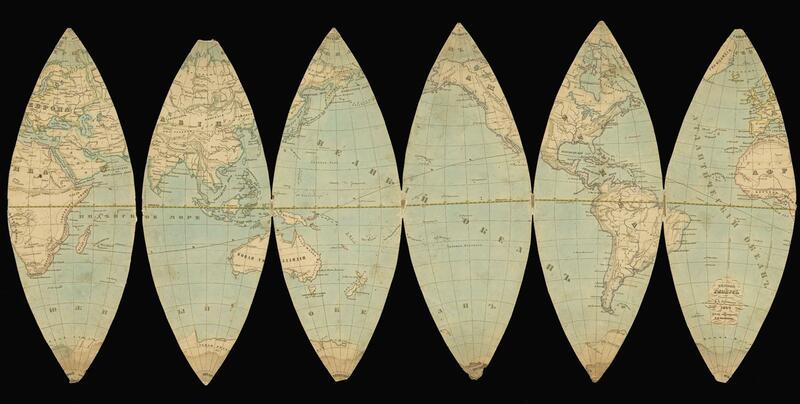 Folding map, text wood-engravings. 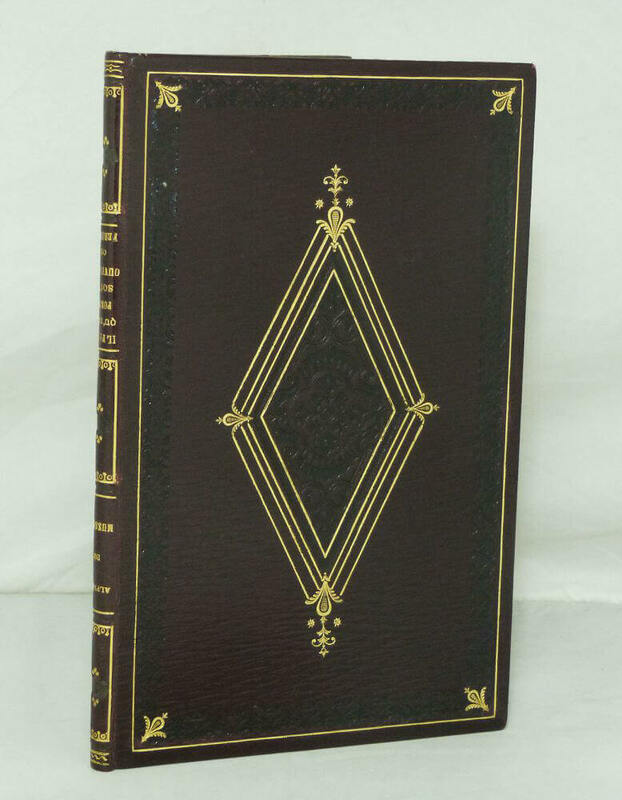 London: John Churchill; Exeter: Adam Holden, 1849. 223 x 142 mm. Original blindstamped cloth, gilt-lettered spine, light wear at extremities. Fore-edges a bit frayed but very good. Presentation Copy, inscribed â€œFrom the Authorâ€ on the front pastedown; manuscript captions for the bookâ€™s illustrations in what may be the same hand. Modern bookplate. First Edition. 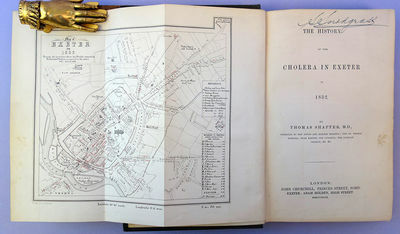 Shapterâ€™s history of Exeterâ€™s 1832 cholera epidemicâ€”part of the worldwide cholera pandemic of 1829-51â€”includes his â€œMap of Exeter in 1832 shewing the localities where the deaths caused by pestilential cholera occurred in the years 1832, 1833 & 1834,â€ one of the first examples of an epidemic â€œspot map.â€ â€œShapterâ€™s text and map presented a â€˜topography of diseaseâ€™ in which the incidence of cholera over three years was considered within the city of Exeter. Shapter recorded both mortality and morbidity across the outbreak in a chart of epidemic occurrence. He then used official mortality reports that included decedentsâ€™ street addresses to locate cholera mortality in a map of the city. A mortality ratio based on parish population was recorded in the map legend. This amounted to a spatial description of mortality data . . . mapped clusters of cholera appearing to occur more frequently in parishes along the low-lying riverbanks of the city . . . than at higher altitude away from the river where air was purerâ€ (Koch, Disease Maps: Epidemics on the Ground, p. 156). Shapterâ€™s map, which did not mark wells or pump locations, appeared to confirm his theory that cholera was a miasmatic disease caused by â€œbad air.â€ John Snow, whose On the Pathology and Mode of Communication of the Cholera appeared the same year as Shapterâ€™s work, interpreted Shapterâ€™s data differently, using it to help demonstrate the link between disease outbreaks and contaminated water sources. Garrison-Morton.com 7689. New York, 1849. Tinted lithograph with additional hand-coloring, 13 1/2 x 18 1/4 inches. Mild foxing. Very good. Matted and framed. An attractive view of Broadway, New York City by famed artist John Bachmann who was, at the time, only at the beginning of a brilliant printmaking career. 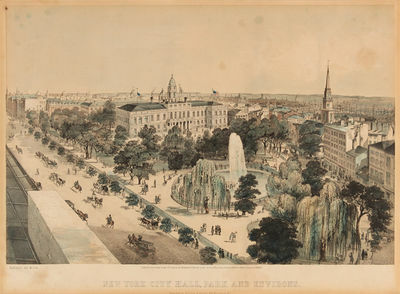 According to Reps, Bachmann executed two views of New York City in 1849, though Reps does not record this one. Here, Bachmann portrays Broadway in a clean and very inviting manner. "Along the broad thoroughfare moves a smart array of carriages, coaches, and fashionably-dressed pedestrians. The fountain playing in the imperfect triangle of City Hall Park had now permanently replaced the temporary one erected there during the Croton Water Celebration that took place there in 1842. Beyond the fountain is City Hall itself, admired by residents and visitors alike for its architectural splendor: a successful adaptation of French Renaissance and American colonial influences" - Deak. Bachmann's reputation as a fine artist, lithographer, and printer is assured through his work, even if only considering his New York City views. Little is known of the man himself, though he is believed to have emigrated from Germany in the 1840s, bringing with him a fully- developed style and competence unusual for the period. "No finer artist of city views worked in America than John Bachmann" - Reps. A fantastic and rare view of New York's famed City Hall, an important depiction of lower Manhattan and Broadway in the middle of the 19th century. DEAK, PICTURING AMERICA 596. STOKES, ICONOGRAPHY OF MANHATTAN ISLAND III, p.902. STOKES & HASKELL, AMERICAN HISTORICAL PRINTS, ca. 1849-E- 117, p.105. 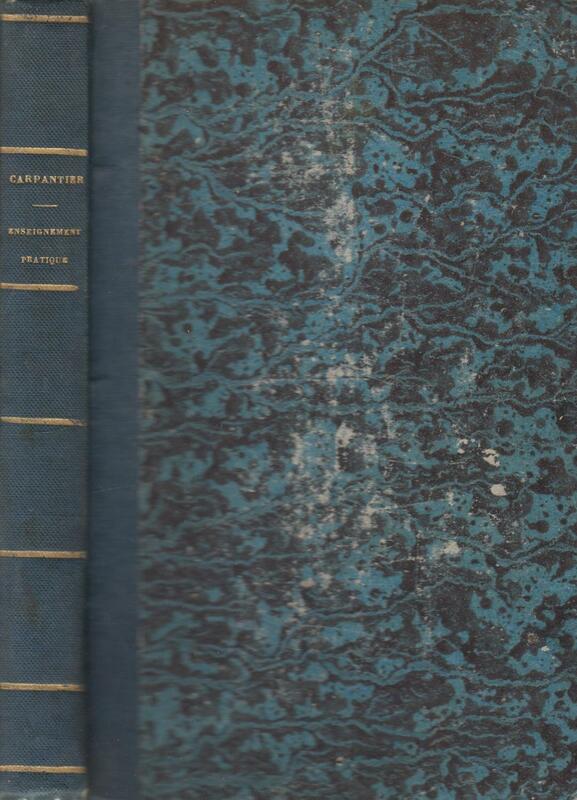 REPS, VIEWS & VIEWMAKERS, pp.160-61. LAMARTINE, Alphonse de Prat de. Raphael, paginas da juventude . versão portugueza de Don Carlos Guido y Spano. 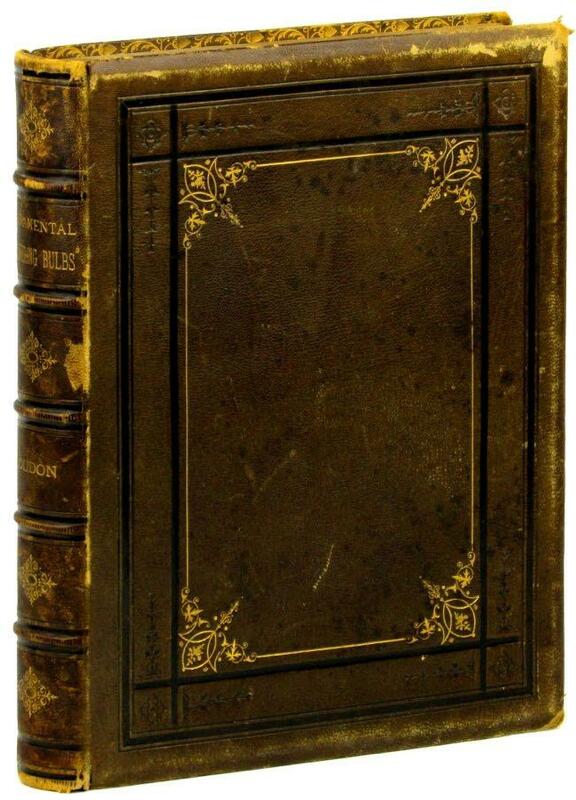 London: Smith, Elder, and Co.,, 1849. 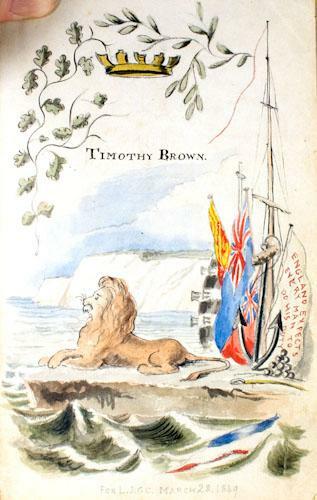 With illustrations, drawn and etched by the author. Octavo (255 x 173 mm). Bound by Zaehnsdorf c. 1900 in brown full morocco, raised bands to spine, spine gilt-lettered and ruled direct, front and rear covers with frame ruled in gilt, wide turn-ins with ornate gilt rolls plus gilt borders to pastedowns, top edge gilt, marbled endpapers, with binder's mark. 14 plates. Slight wear to head of spine, minor rubbing to extremities, tanning to free endpapers from decorated turn-ins, first four leaves browned, an excellent copy. First edition. The first of Ruskin's works to carry his name, and the first to be illustrated, this essay introduces his principles of architecture and is important for laying the foundations for Ruskin's later work, The Stones of Venice. (New York: American Art Union), 1849, 1849. First American Art-Union edition. BAL 10340; Hamilton, Early American Book Illustrators, 603. 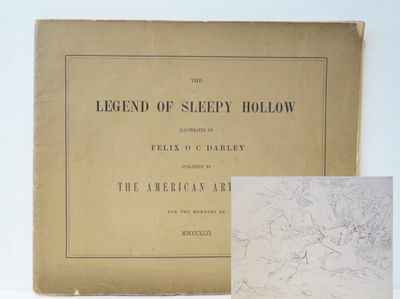 Wrappers a little worn and dust-soiled; some minor foxing; a very good copy.. Oblong folio, original printed wrappers. Six lithographed plates. One of several collaborations between the great American artist F.O.C. Darley and the great American author Washington Irving, two of which were publications for the American Art Union of stories from Irving's Sketch-Book. Beckx, Jean Pierre, 22. General der Societas Jesu (1795-1887). Eigenh. Brief mit U. Wien, 2. I. 1849. 1849. 4 SS. auf Doppelblatt. 4to. An einen namentlich nicht genannten Adressaten: "[...] Um die Wünsche und Aufträge S. E. des Grafen v. Brandenburg abzuwarten und auszuführen habe ich bis auf diesen Augenblick meine Abreise aufgeschoben. Wenn S. E. der Hl. Graf in diesen 4 Wochen nicht Zeit gehabt hat, sich über diesen Punkt auszusprechen (wie ich Solches bei seiner jetzigen Stellung sehr begreiflich finde) so sehe ich keinen Grund zu hoffen, daß er in der nächsten Zukunft mehr Zeit dazu finden dürfte: zudem glaube ich es meinen Vorgesetzten gegenüber nicht länger verantworten zu können, wenn ich hier noch bleiben wollte [...]". Signeret 1849 C. Frederik Sørensen. 14x23,5. Indrammet. [25x33,5 cm.]. London: William S. Orr & Co., Amen Corner, Paternoster Row, 1849. Second Edition. Full leather. Good. Tall quarto. , x, 270 pages. 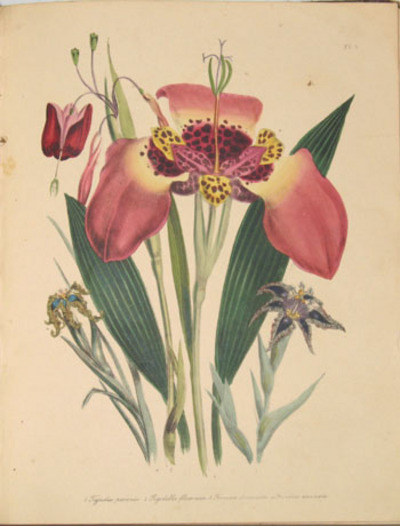 Illustrated with 58 hand colored plates. 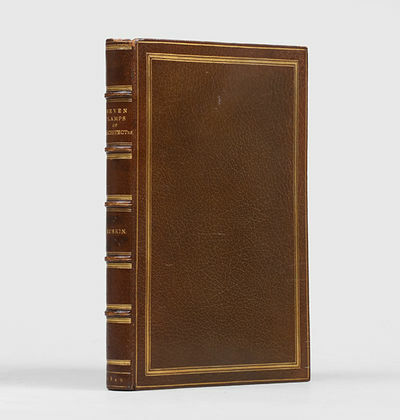 Brown leather hardcover ruled in blind with gilt tooled decorations on boards and on the edges verso of covers. 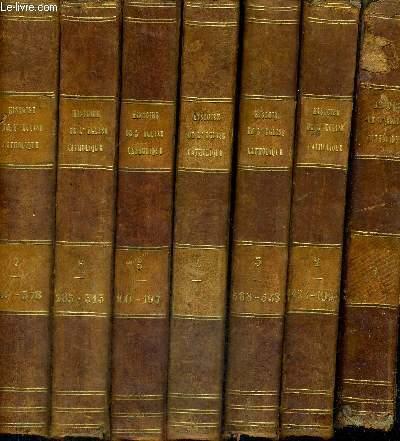 5 raised bands, gilt decorations and title on spine. All edges gilt. Reddish marbled end papers. Former institutional copy from Cogswell College Library with label on front paste down and stamp on contents page. Leather is rubbed on joints, corners, head and base of spine and boards. Pages 2 and 3 have a large closed tear with no missing content. All color plates are in very good condition. 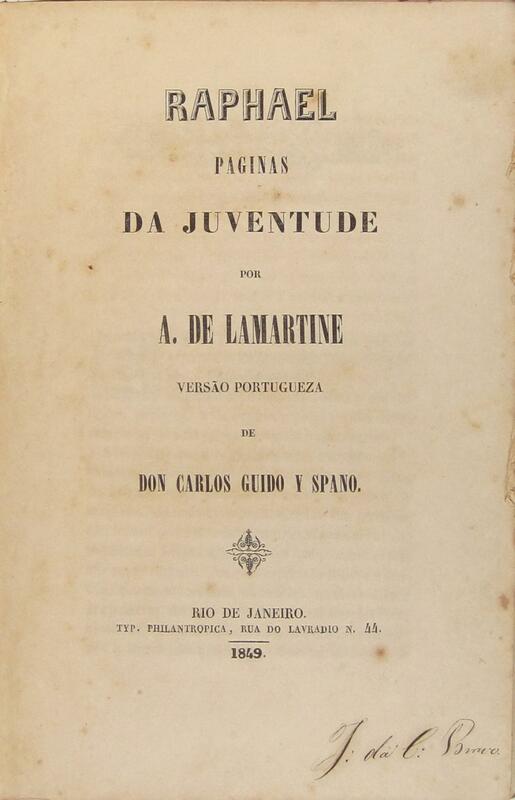 Title first published in 1841. Panorama v. Darmstadt u. Umgebung, schöner Blick auf Darmstadt m. d. Odenwald i. Hgr. Kazan': University typ, 1849. xv, , 339, 149, ,  pp. Octavo. With eight lithographed plans and views (e-catalogues of Russian State and Russian National libraries call for nine plates, but the e-copy from the catalogue of Russian State Library is identical to our copy; a copy from the Warsaw University calls for eight plates). 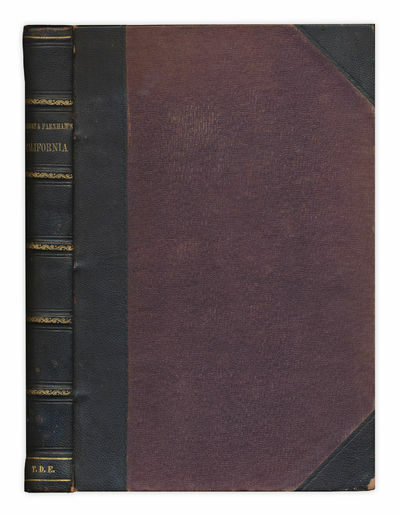 Contemporary half leather with marbled paper boards and color stamped title on the spine. Ink library numbers on the title page and p.17, and library paper labels on the top of the front cover and the spine. 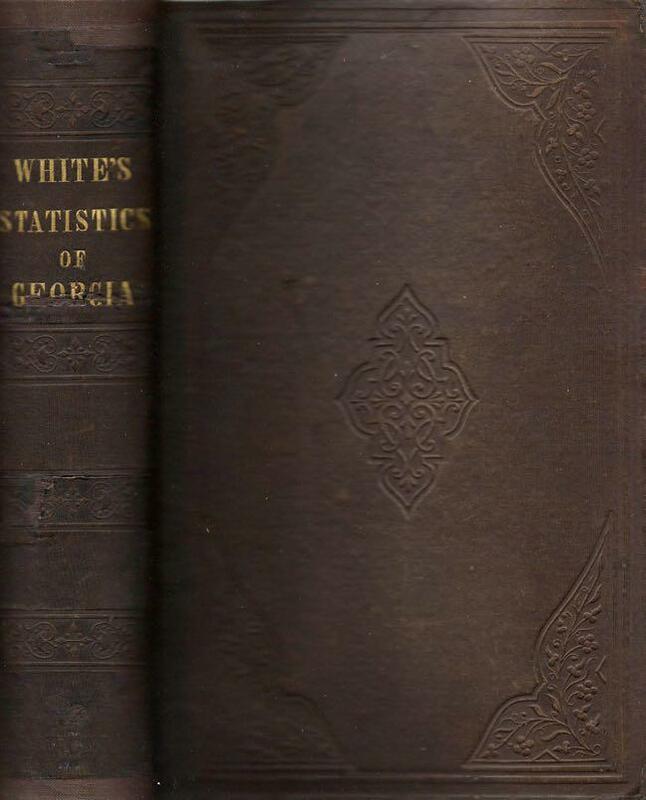 Binding rubbed and worn, with cracks on the top and bottom of the spine, a few of first and last leaves with mild stains on corners of the pages, but overall a very good internally clean copy. First edition. Very rare. Historically important well written account of travels to Dagestan and modern Azerbaijan by a noted Russian Orientalist, Turkologist, later professor of Kazan University (1846-55) and St. Petersburg University (since 1855) Ilya Berezin (1818-1896). Shortly after his graduation from the Eastern faculty of the Kazan University with the degree of Master in Eastern Philology Berezin was sent on an extensive scientific travel to the Caucasus, Persia, Iraq, Syria, Palestine, Egypt and Turkey, which lasted for over three years (1842-45). This book gives a detailed account of the first part of his travel - in the southern provinces of the Russian Empire: Dagestan and the Transcaucasia (modern Azerbaijan). Berezin went from Astrakhan to Tarki (now a suburb of Makhachkala), and from there to Derbent (Dagestan), Quba, Baku, Salyan, Lankaran and Astara (Transcaucasia). 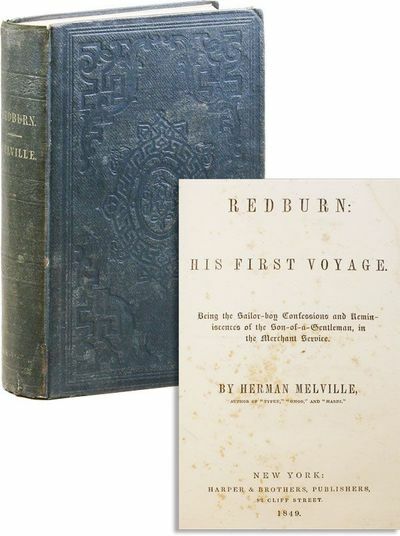 He gives a detailed and valuable description of the history and geography of the region, overviews Russian expeditions to the Caspian Sea, talks about Muslim antiquities and architecture, local people, their occupations, manners and customs, language, food; notes about the Caucasian War (1817-1864) and rebel forces of Imam Shamil; special chapters are dedicated to Derbent and Baku and describe their history, architecture, population, trade and industries at length. 150-page comments refer to numerous sources in Persian, Arabic, Turkish, French and Latin, used by Berezin. The supplements include tables of meteorological observations; tables of distances between Tarki and Astara, from cities of Dagestan and Transcaucasia to Saint Petersburg, Moscow and Tiflis; statistical tables showing population, buildings, industries, churches, mosques etc. of Derbent and Baku; alphabetic catalogue of the library of a Baku bibliophile; alphabetic index of geographical names et al. The illustrations include a plan of the Derbent Wall; two views of Derbent (the mosque and the Kyrkhlyar cemetery); general plan of the fortress and the city of Derbent; plan of the Palace of the Shirvanshahs in Baku; two leaves of facsimile of inscriptions on the walls and tombstones in Derbent; and a map of the mouths of the Kura River and the Ghizil-Agaj bay of the Caspian Sea. 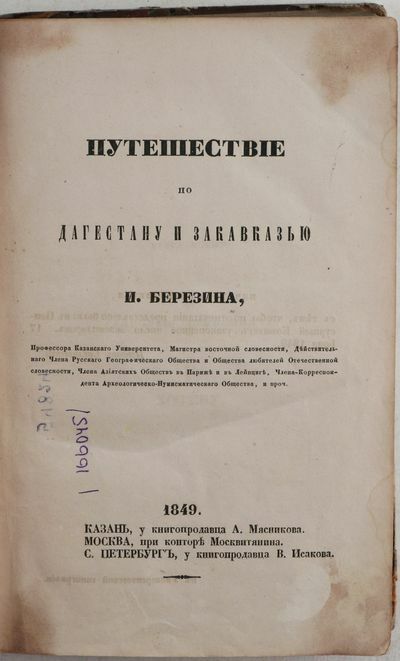 Second revised and enlarged edition of the book was published in Kazan in 1850 (in three parts, with different numeration, but under one title page). Second part of the account of Berezin's travels titled ''Travel to the Northern Persia'' was published in Kazan in 1852. Only two paper copies found in Worldcat (Leiden University, Warsaw University). Fremont, John C.; Emory, William H.
New York: D. Appleton & Co., 1849. This antique hardcover book is rebound in 3/4 leather with gilt spine lettering and decoration. Bookplate on front inner board; writing on front endpaper; fold-out map has tear, but is intact. Binding is tight. Stain at lower edge of first 30 or so pages, some foxing to endpapers; most inner pages clean. The book is compiled from the official reports of Fremont and Emory, combining portions of previously published works (Fremont's 1848 "Geographical Memoir Upon Upper California"; Emory's "Notes of a Military Reconnaissance," also from 1848; and Fremont's "Narrative of an Exploring Expedition to the Rocky Mountains in the Year 1842, and to Oregon and North California in the Years 1843-44"). Also bound in with this title is an 1843 edition of Farnham's "Travels in the Great Western Prairies," up to Chapter 9, missing the last 9 pages of text. About 350 pages, 6"x9".. Hard Cover. Good/No Jacket. Illus. by Illustrated. This author and socialite made up for the accident of her ultra-privileged birth through religion, philanthropy and advocacy of many social causes. ALS, 2pp (lettersheet), 4" X 6", Lenox, MA, 31 October n.y. 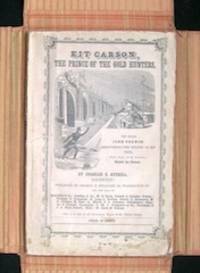 Addressed to Mr. Riis (likely Jacob A. Riis, 1849-1914, pioneering Danish-American muckraking journalist and social reformer).Very good. Intriguing content concerning Sloane's do-goodism: "I have decided to act upon your suggestion and entrust the monthly delivery of the aged couple's Rent to a member of the A.B.C. I doubt if I will be able to go myself, but I am sure one of the men will be very happy to visit the old people in their home.... I agree with you in thinking that it is more blessed to give than to receive...." Boldly penned on "Elm Court / Lenox" letterhead, the famous shingle-style home her parents had built around 1885. One of Riis' well-known tenement photographs depicts two elderly sisters seated in their New York apartment, the caption usually noting that in 1895 Riis persuaded Emily Vanderbilt Sloane to pension these two elderly sisters named Gribbon. 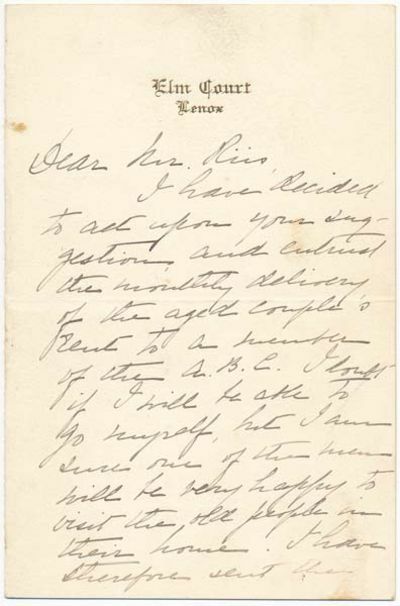 This outstanding letter is without doubt written to Jacob Riis -- and chances are strong it pertains to this same or some similar charitable act that he convinced Sloane to underwrite. Russian Globe] Terrestrial Globe Established by V.K. Krotovii Of the War and Topographical Office. V. Poliakov, [St. Petersberg] 1849 - A Cyrillic globe Set of eight globe gores, mounted on cloth, with fine original colour, some a minor discolouration and loss at poles. 830 by 370mm (32.75 by 14.5 inches). Kramer, Wilh. Medizin 1849. KEIN Reprint! Die Erkenntniss und Heilung der Ohrenkrankheiten. 2. gänzl. umgearbeitete und sehr vermehrte Aufl. Berlin, Nicolai, 1849. 21 x 14 cm. * Mit 2 mehrfach gefalteten Kupfertafeln. * XVI, 871 (1) S. HLwd. d.Zt. mit vergold. Rtitel. Die Erkenntniss und Heilung der Ohrenkrankheiten. 2. gänzl. umgearbeitete und sehr vermehrte Aufl. Berlin, Nicolai, 1849. 21 x 14 cm. * Mit 2 mehrfach gefalteten Kupfertafeln. * XVI, 871 (1) S. HLwd. d.Zt. mit vergold. Rtitel. - Mehrfach gestempelt, Zustand 2 bis 3 (aber sonst nicht beschädigt). - Hirsch/H. III, 599 Politzer I, 546 f. Relevante Ausgabe seines Erstlings- und Haupwerkes. K. war bestrebt, die Ohrenheilkunde nach eigenen Gesichtspunkten aufzubauen. Die Schärfe und Konsequenz, mit der er seine Ansichten verfocht, trugen dazu bei, seinen Lehren durch nahezu vier Dezennien autoritativa Geltung zu verschaffen ... (Politzer). Kramer ist es zu verdanken, daß sich die Ohrenheilkunde auf Grund seiner Forschungen und Publikationen zu einer angesehenen selbständigen Disziplin in der Medizin entwickelte und befreit wurde von dem Nimbus des Mystizismus und der Scharlatanie. .
Wiener Briefe vom Hans Jörgel von Speising. 1.-10. Dutzend. 3 Bde. (Alles!) gr.-8. Mit mehreren Holzst. HLdr. d. Zt. m. goldgepr. Rückensch. Rü. gebleicht. Hayn -Got. VIII, 461 Slg. Mayer 7205 Weller 279. - Ursprünglich in Einzelheften in der von J. B. Weiß zw. 1849 u. 1854 hrsg. "Wiener Volkszeitung" erschienen und aus diesem Grund selten komplett. Mayer nennt nur das 1. Dutzend 1851 (aus der Österr. Volkszeitung) - entspricht dem 1. Teil des ersten Bandes. izdanie vtoroe. 2 nd edition. Gross-Oktav. 327 pages / Seiten. Original Kartoniert. Rücken am Kopfsteg verstärkt, Namenszug auf Umschlag, sonst gut, keine Stempel. Spine a bit fixed, name on cover, no stamps. Ivan Petrovich Pavlov (1849-1936) won the Nobel Prize in Physiology in 1904. Reichs-Gesetz-Blatt. 1. Stück, 29. 9. 1848 &#150; 18. Stück, 7. 6. 1849 (alles Erschienene) 160 S. Dazu: 1 Bl. &#132;Bekanntmachung" (Vorankündigung des Reichs-Gesetz-Blattes). 4°. Pappbd d. Z. (Kanten berieben). 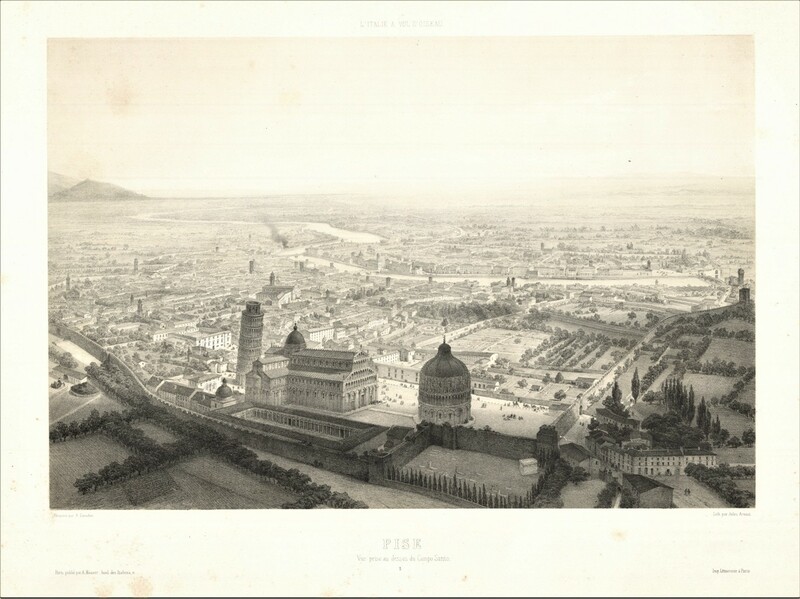 Frankfurt, (Naumann), 1848-1849. - Vollständige, äußerst seltene Folge, die im 8. Stück (S. 49-60) das &#132;Gesetz betreffend die Grundrechte des deutschen Volks" und im 16. Stück (S. 101-147) die von der Nationalversammlung am 28. 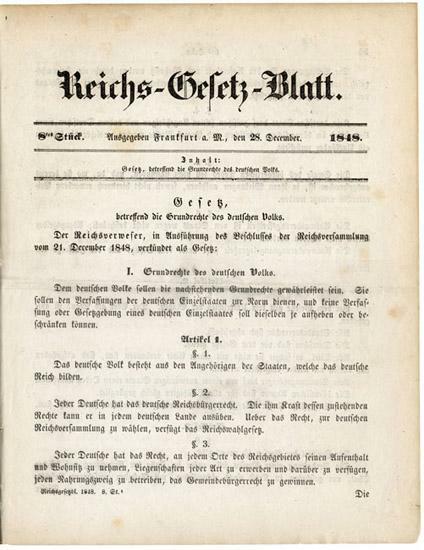 März 1849 bekundete Verfassung des deutschen Reiches enthält. Es handelt sich hier um den 1. Druck der ersten deutschen demokratischen Verfassung und um den 1. Druck der ersten Fixierung der Grundrechte des deutschen Volkes! Beide Gesetze sind hervorragende Dokumente zur Geschichte unserer Demokratie, die ihre Wirkung bis weit in unser Jahrhundert zeitigten. &#132;Die Väter des Grundgesetzes von 1948 waren gut beraten, sich an dem ein Jahrhundert alten Gesetzentwurf der Paulskirchen-Abgeordneten zu orientieren. Etwa 95% der wichtigsten Grundsätze unseres heutigen Grundgesetzes befinden sich bereits im Text von 1848!" (Voerster). &#150; Das erste Blatt mit kleinem, altem Bibliotheksstempel. Nur anfangs gering stockfleckig. &#150; Friedlaender 72. 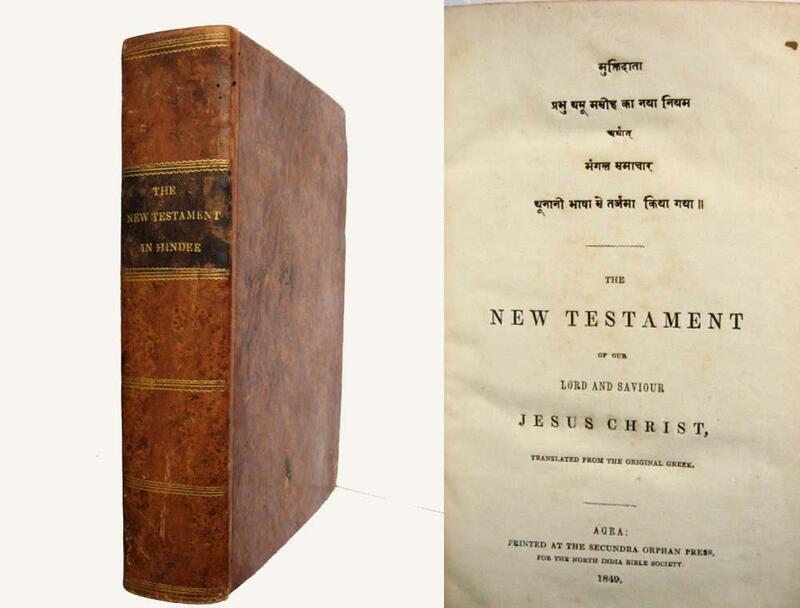 Prabhu Yasu Masi Ka naya niyama &#150; The New Testament of our Lord and saviour Jesus Christ". Teilansicht, Lichtentaler Allee, "Erinnerung aus alter Zeit. 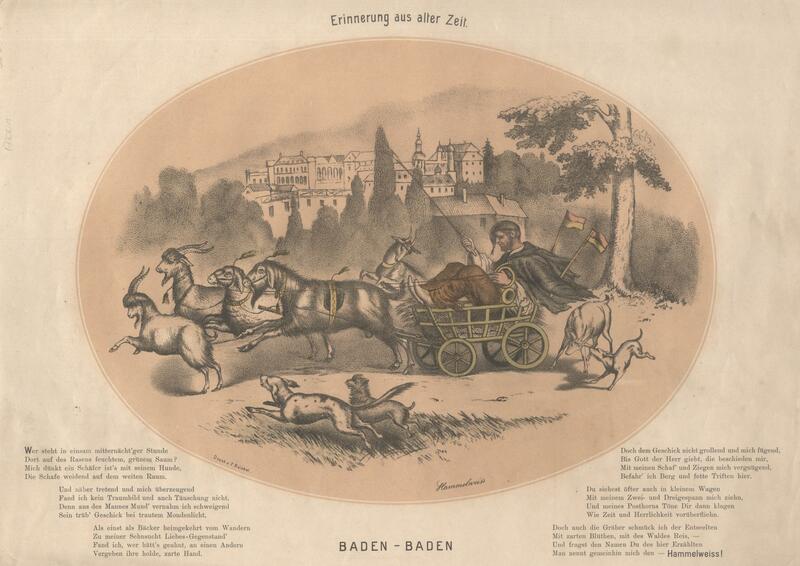 Baden-Baden". - Farblitho. m. Tonplatte v. Hammelweiss b. F. Reichel, 1849, 24,6 x 34 im Oval - Blattgr. 32,5 x 43,4 cm Sehr seltenes Blatt des Baden-Badener Originals Ignaz "Hammelweiss", der in einem Korbwägelchen, das er mit Ziegenböcken bespannt hat, durch die Lichtentaler Allee kutschiert. - Rechts und links unter der Darstellung ein 6-strophiges Gedicht. - Minimal fleckig und angestaubt, sonst farbfrisch und gut erhalten. 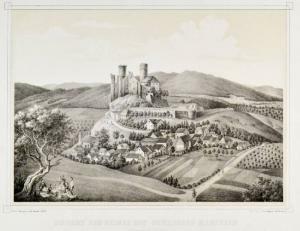 HANSTEIN/bei Bornhagen., "Ansicht der Ruinen des Schlosses Hanstein von der südöstlichen Seite". Blick über die Fachwerkhäuser des Ortes zur Burgruine, vorne links biedermeierliche Gesellschaft beim Picknick. 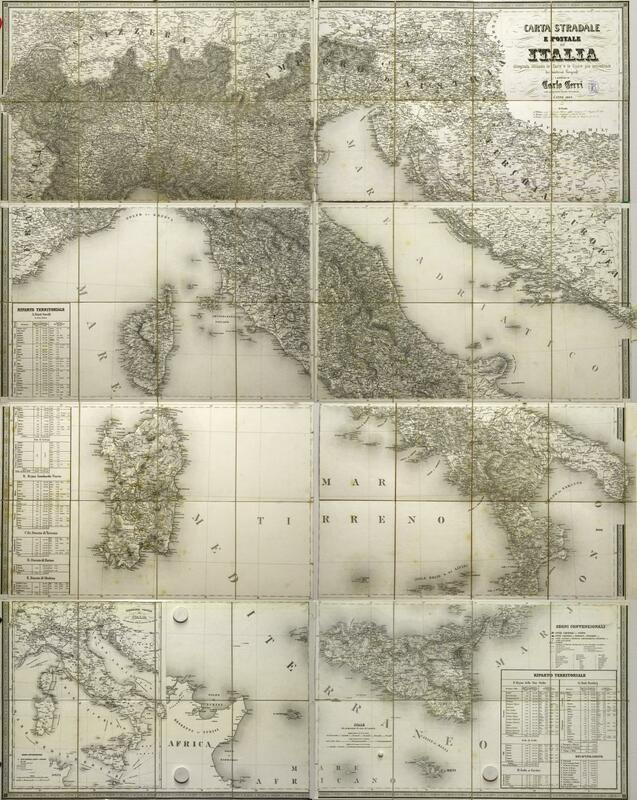 Kupferstich - Karte, bei Carlo Cerri, "Carta Stradale e Postale dell Italia disegnata secondo le Carte e le Opere piu accreditate dei moderni Geografi . 1849".